​Welcome to Hobe Sound & Jupiter Island! Discover an understated elegance. Whether this is your home-town or your home-for-now, let me welcome you to Hobe Sound. Our town is unique in every way; a slice of old Florida charm where residents value small town friendships and warmly welcome newcomers. With sandy toes and a sun-kissed nose, I challenge you to explore Hobe Sound’s collection of unique shops, eclectic galleries, funky eateries and peaceful nature parks. I am proud to share that Hobe Sound was recently named the best beach town housing market in the United States, by RealtyTrac, a real estate data company. Hobe Sound is number one based on the low crime rates, warm weather, affordable housing market, clean environment and friendly residents. The Hobe Sound Chamber recently celebrated its 35th anniversary in 2016. Our founders were committed to providing Hobe Sound residents, visitors and businesses with critical resources and services. Today, the Chamber continues to be steadfast in the mission to keep our community members informed while providing a myriad of programs, events and services that enhance the community and help small businesses sustain and grow. This website is a resource filled with valuable information. We are proud to provide it as a complimentary service. This site will not only introduce you to Chamber members, it can assist you with planning recreational activities and provide newcomer information. Becoming familiar with our Chamber of Commerce is the first step in becoming familiar with, what some call the “quietly elegant” community of Hobe Sound and Jupiter Island. We are an active organization of business professionals and residents working together to improve the economic and civic viability of our area. 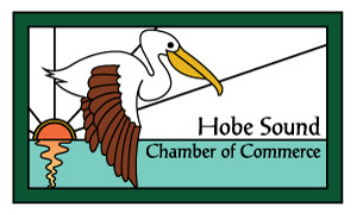 The Hobe Sound Chamber is privately funded and thrives solely on the support of its membership. We ask that you give special consideration and make it a priority to do business with chamber members. Without their community contributions, the Chamber as well as other local non-profits and sports leagues would not exist. Thank you for welcoming the Hobe Sound Chamber into your life. Whenever possible, patronize chamber members, who clearly support the Chamber’s mission, supply jobs, contribute to local charities, support our education system and youth activities and help provide the quality of life we enjoy daily.